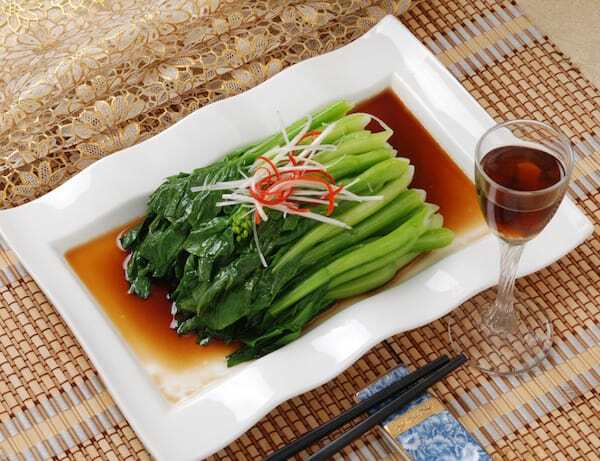 Today’s recipe, broccoli rabe with oyster sauce, is an authentic traditional Chinese dish recipe. It is especially good to eat in summer, along with other dishes, such as ma po szechuan tofu recipe and moo goo gi pan recipe. We are using a traditional Cantonese cooking method, called “bai zhuo”, meaning boiling in water. This method is designed to preserve the food nutrition as much as possbile with minimum processing waste. Broccoli rabe contains an organic base, which makes it have a bitter taste, but can stimulate the taste nerves, therefore increase appetite. It is rich in dietary fiber, which can help digestion, prevent constipation, lower cholesterol, soften blood vessels, and prevent heart disease. However, balance is the key. Even though it seems like broccoli rabe may have 100 benefits, there is always one thing, or at least one thing we should make note of. Chinese medicine believes that broccoli rabe can consume people’s vital Qi inside the body. Overeating will actually inhibit hormone secretion. When boiling broccoli rabe, there are two important factors that play into the color presentation of the dish. First, be careful not to overcook. Usually one minute is maximum. Also, adding a few drops of oil to the boiling water can help preserve the green color. Now let’s get started! You can do it! A healthy and simple broccoli rabe recipe using traditional Cantonese cooking method, which tends to preserve the most nutrients from food. Cut the root of broccoli rabe. Wash and drain. Add one tablespoon oyster sauce and one tablespoon steamed fish soy sauce to a small bowl. Bring a pot of water to boil. Add 1/2 tablespoon oil. Boil broccoli rabe in the pot for 30 seconds. Turn off the heat. Continue to boil for another 30 seconds. Remove and soak in cold water for one minute. Transfer broccoli rabe to a plate. Arrange nicely. Heat 1/2 tablespoon oil in a pan. Add ginger and green onion slices. Stir-fry until fragrant. Pour the sauce prepared in step 2 over the broccoli rabe. Add ginger and green onion slices no the top.